Our business philosophy is simple – we take care of our customers, and our customers will take care of our business. This may sound a bit old-fashioned, but in our situation it is what has driven us over the years and is built into our core. With this approach we earn your trust, and with your continued trust – we have the privilege of continuing to service your vehicles. All members of the team support this simple approach to customer service, allowing us to attract and retain the most talented in the industry. This means that we have the skills to diagnose and repair your car correctly the first time, every time. We are convinced of this, so we offer an industry leading warranty that is twice the standard. Continuing our focus on customer service, we recognize that our customers’ time is valuable. So we invested in a courtesy shuttle that provides our customers the freedom of scheduling their vehicle’s service – during the week – not having to sacrifice their valued weekends for car repair. We believe that this simple philosophy is what sets us apart and allows us to be distinctive in the automobile service industry. Our Customer Service Shuttle: ensuring easy transportation for you to and from our facility when you drop off and pick-up your car. 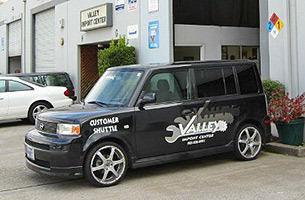 Our Courtesy Van’s hours of operation are from 7:30 to 4:30 – within a 15 mile radius of Valley Import Center.